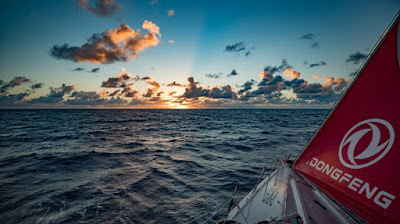 Following a big send-off from Itajai, Brazil, on Sunday, the seven-strong fleet – back up to full complement with the welcome return of Vestas 11th Hour Racing and Sun Hung Kai/Scallywag – faced a tricky opening night of unpredictable weather. There was little chance for the sailors to acclimatise slowly as constant variations in wind direction and strength meant numerous sail changes. Onboard Turn the Tide on Plastic, skipper Dee Caffari welcomed the slightly more stable conditions that greeted the teams with sunrise. “The first night at sea is always interesting,” she said. “It takes a little while to get back into the routine and with all the boats so close together it can change the way you sail. MAPFRE were the early leaders in the opening hours but Xabi Fernandez’s crew were reeled in after they got caught out by a cloud. At 1300 UTC, and with just over 200 miles of the 5,700-mile leg ticked off, it was Turn the Tide on Plastic that topped the table, with Brunel in second and Scallywag, the most northerly boat, in third. The more southerly-positioned Dongfeng Race Team, Vestas 11th Hour Racing, MAPFRE and AkzoNobel were in fourth to seventh respectively. However the ranking is calculated to a series of waypoints without taking into account routing due to weather, and in reality less than five miles separate first to last place at this early stage. While the Leg 8 finish line in Newport, USA, lies some 4,000 miles north, the teams are battling to get east as quickly as possible so they can hook into stronger breeze that will fire them around Brazil’s most easterly point. Over the course of the day the breeze is forecast to weaken and shift to the right, forcing the teams into a tactical tacking battle as the sun sets. Fans of the race can follow the action in real time, as the tracker will remain live for the first 48 hours of the leg.